Residents of the Front Range corridor and eastern Colorado may be dealing with snow-damaged trees after tonight and tomorrow's snowstorm, and may soon be considering actions to protect and repair them. Keith Wood, community forestry program manager for the Colorado State Forest Service, said that although the first impulse may be to start sawing when a tree is damaged, homeowners should first assess the situation to avoid hurting themselves or further damaging the tree. * Check for hazards. Before approaching a tree, examine your surroundings to avoid making contact with downed utility lines or standing under broken, hanging branches. * Contact city officials if necessary. 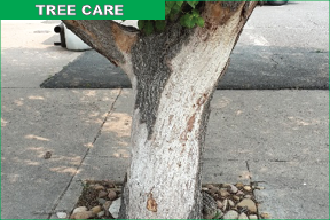 Trees between the street and a city sidewalk may be the responsibility of city crews. * Assess the damage. If a tree is healthy overall and still possesses its leader (the main upward branch), most of its major limbs and 50 percent or more of its crown, the chance is good for a complete recovery. * Be careful knocking snow off branches. This may cause the branches to break. If you must remove snow, gently push up on branches from below to prevent adding additional stress. * Remove broken branches. This minimizes the risk of decay and insects or diseases entering the wound. Prune at the branch collar - the point where a branch joins a larger one - and be mindful of potential pent-up energy if the branch is twisted or bent. * Don't over-prune. With the loss of some branches, a tree may look unbalanced, but most trees quickly grow new foliage that hides bare areas. * Don't try to do it all yourself. If the job requires running a chainsaw overhead, sawing from a ladder or removing large branches or entire trees, contact an insured, certified arborist. Professionals often are listed in the phone book under "tree services." For more information about caring for storm-damaged trees, visit the CSFS website or go to http://static.colostate.edu/client-files/csfs/pdfs/Storm_Damage_Quick_Guide.pdf. To find an ISA-certified arborist, visit www.isa-arbor.com.